Europe continues to be affected by the cold and harsh weather conditions that made their debut as world leaders converged at the climate change summit in Copenhagen last week. The climate change summit was an event which was assembled at considerable cost to address a "global warming" crisis. 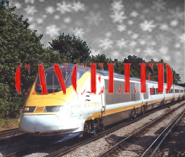 Eurostar, the train service that runs under the English Channel and connects England, France and Belgium, has been shut down indefinitely as a result of the "acute weather conditions in northern France." Nearly half of all flights out of Paris' Charles de Gaulle and Orly Airports were cut Sunday through mid-afternoon, with more cancellations forecast for Monday. "They have promoted themselves as the 'green,' stress-free alternative to flying and now they face a major technical issue that they need to get on top of." Could one issue be that Eurostar "green" management did not anticipate a future with cold wintery weather (er, climate?) conditions when they prepared their long range forecasts?